After so many horror films about teens and college kids facing their doom, their friendships unravelling in the face of danger, it’s refreshing that this time it’s the older but not wiser getting their comeuppance. With the youngsters I tend to bear in mind how much of an annoying, supercilious whiner I was at that age – and regret on their behalf that after being torn apart trying to escape a mist-wreathed cabin in the woods, they’ll never get the chance to become a fully-rounded, reasonable, likeable person like me. In director Caitlin Koller’s horror/thriller though, the potential victims are ex-college kids. Older, richer, just as supercilious, and with past love affairs getting in the way (them, not me), I had no problem enjoying their traumas. ‘Kill them! Kill them now!’ I thought meanly, as potential deaths and bloody injuries were teased with deliciously well-known horror tropes. Larry (Rob Benedict) spent years at college stealing everyone’s girlfriends and you can see why as he’s still gorgeous, as the shallow ones among you will be thinking. 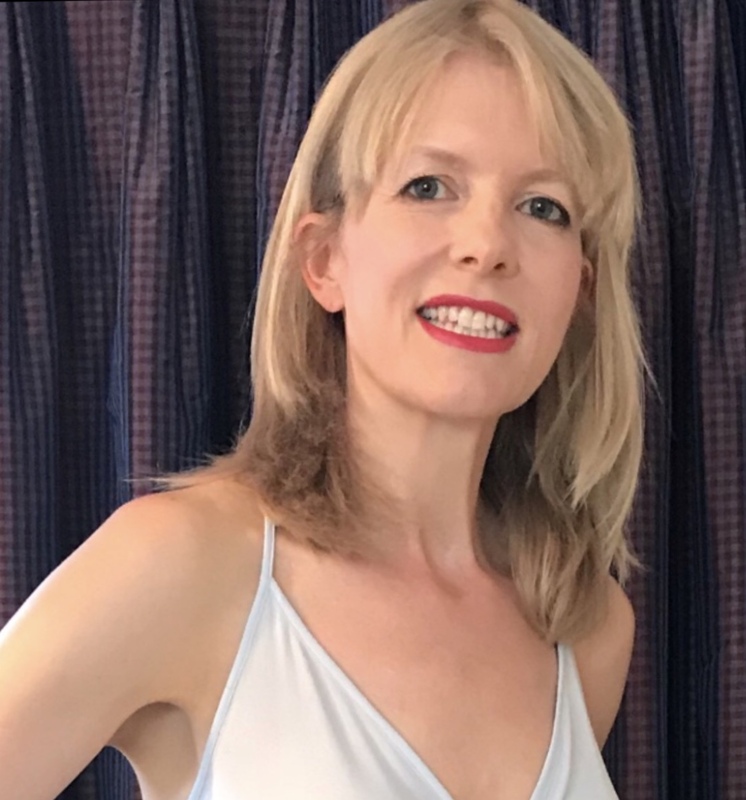 Elaine (Seana Kofoed, also the film’s writer) is a lesbian and appears to have had no action at all through university, followed by years at home looking after her mother. Bess (Cathy Shim) has history with more than one of the men (not like… oh) and is still seething at how little anyone (particularly Elaine) has bothered with her since she sank into motherhood and domesticity. Missing both her children’s baby showers seems to be her main gripe. Jack (Postell Pringle) seems jealous of the others and their success but trumps them all by arriving late with his 20-something girlfriend Amber (Marielle Scott), who is both beautiful and rather fun. (She also gets it much quicker, not being weighted down with college-era baggage: “this is not rustic Jack, this is survival.”) She’s a welcome addition, adding another layer of friction to a group that hasn’t seen each other enough in the intervening years to maintain a solid base. Their realistic mix of smugness and regret makes watching them both fascinating and fun as they raise eyebrows at the idiocy and rudeness of younger, better-looking people; and sigh at their own missed opportunities, deserved yet for some reason unfulfilled. They’re all meeting up – after years of “let’s get together soon” messages – to attend the funeral of Max, the other person in their college friendship group. A university professor, he had been living out in rural Wisconsin with his wife Sylvia and his elderly mother. As the friends drink and banter in Max and Sylvia’s triangular guest house, strange things begin to happen, and Sylvia regularly reappears to drop information bombs that manage to be both factual and decidedly unnerving. 30 Miles From Nowhere boasts an excellent ensemble cast. Everyone plays it completely straight, while Koller ladles on the traditional horror tropes, from the cabin in the woods to whether their fears are down to evil or indigestion. And while there are some issues with the plot and actual scariness, she’s crafted an intelligent and witty comedy-thriller that never collapses into self-referentialism. The isolation, lack of mobile phone signal and rainstorm (making escape impossible before daylight) feel entirely natural. This is rural Wisconsin, as we’re often reminded. Even when the lights go out and they have to investigate the creepy basement for lamps and candles it could be entirely innocent, and what country bolthole doesn’t have bugs? City dwellers Amber and Elaine, lying eyes closed on a bed in some semblance of intimacy, are horrified to discover that what they thought was the delicate stroke of the other person’s fingers was actually the scuttling of cockroaches. As unease becomes fear, strange figures appear outside in the pouring rain and odd noises come from inside the house. Eventually they have to face the question: is Max alive, dead, or undead? And which would be worse? Flirting turns to fighting, and friendships start to frazzle. Apart from the cockroaches, the comedy is mostly in that dialogue, and Carrie Preston’s performance as the fabulously odd and ambiguous Sylvia. The characters often speak too fast though, and I missed some of the chitchat (also more of an issue for non-US viewers who won’t get all the references anyway). At times it feels confusing: which of the shocks and scares are meant to be real, what is supernatural or the manifestation of psychological turmoil. I know that’s the point, but I didn’t always feel there was enough going on in terms of building menace and tension to justify that question. Sometimes it just felt like odd, unlinked incidents. The last section loses its way, and the denouement feels a bit flat. It’s also not that scary, and is probably better viewed as a thriller than a horror movie. Still, the cast are entirely believable, juggling bitterness at each other’s successes, jaded ennui, and delight at sinking into familiar friends-with-benefits hook-ups. Preston is also delightfully creepy as the weird Sylvia, a mixture of naive country dweller and crazy dog lady. I honestly wasn’t sure what she might be up to, if anything – whether she was another horror red herring or just evil. Appropriately, her comments drip with double meaning: “I think he always knew you guys would be there at the end”, she says of Max, and every reassurance she gives just makes things worse. The music too is fabulous, and adds another layer of foreboding, without ever tipping into horror parody. 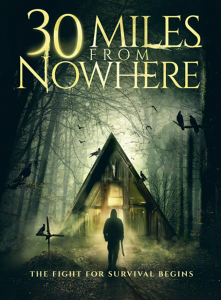 TRAILER – 30 MILES FROM NOWHERE from 30 Miles from Nowhere on Vimeo.